Reminder! SmartEnroll Has Moved to LEAN - CareValue, Inc.
SmartEnroll has moved to LEAN™, UnitedHealthcare’s landmark electronic application navigator. We are pleased to announce that the technical migration errors some agents were experiencing with the SmartEnroll move to LEAN have been resolved. You can now take full advantage of the tool by accessing LEAN through the Agent Distribution Portal or by downloading the LEAN app from the app store. Billing options have been updated! Today, consumers who enroll in AARP® Medicare Supplement Insurance Plans, insured by UnitedHealthcare Insurance Company, with requested effective dates of more than 30 days from the submission date will have the option to sign up for recurring Electronic Funds Transfer (EFT) withdrawals or monthly coupon payments. The one-time immediate EFT withdrawal will not be taken from these consumers. For consumers who request an effective date of less than 30 days from the submission date will need to pay the first month’s premium payment via EFT within 24 hours upon application acceptance. eWelcome Kits* are now available! Members now have the option to receive their Plan Documents electronically when applying through the AARP Medicare Supplement Online Enrollment Tool within LEAN. (This option is currently not available for paper applications.) This electronic option gives members access to plan specific documents for viewing, saving or printing. Documents include important information such as a Certificate of Insurance, an outline of plan benefits, a hospital directory for AARP Medicare Select Plans, and a Guide to Health Insurance for those enrolled in Medicare. Members will still receive their Member ID card and a coupon book for payments (if it applies) through U.S. Mail. *Option is available for AARP Medicare Supplement online enrollments only. 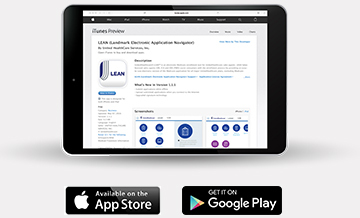 Download the LEAN app from the App Store or Google Play. You can also access it online or through the Agent Distribution Portal.